This is my first time deploying an ASP.NET website, so I'm not sure what the problem is. You need to reference both Microsoft.ReportViewer.WebForms and Microsoft.ReportViewer.Common and set the CopyLocal property to true. This will result in the dll's being copied to our bin directory (both are necessary). And that's all. For me is ok. I ran into the same error. My web app was pointed towards report viewer version 10.0 however if 11.0 is installed it adds a redirect in the 10.0 .dll to 11.0. This became an issue when 11.0 was uninstalled as this does not correct the redirect in the 10.0 .dll. The fix in my case was to simply uninstall and reinstall 10.0. Upload the file Microsoft.ReportViewer.WebForms.dll to your bin directory of your web applicaion. You can find this dll file in the bin directory of your local web application. I had this error with an old webforms app. Turns out there was a line in the markup causing the issue. I removed it and the error disappeared. It took a while until I understood that not only the version was changed but also the public token key, as you can see above. I had the same error for a different package. My problem was that a dependent project was referencing a different version. I changed them to be the same version and all was good. Copy dll Microsoft.ReportViewer.WebForms.dll into Bin folder in your project. Add new reference from bin folder. My trial version of DevExpress had expired. Try renewing it again. Updating ReportViewer should works. 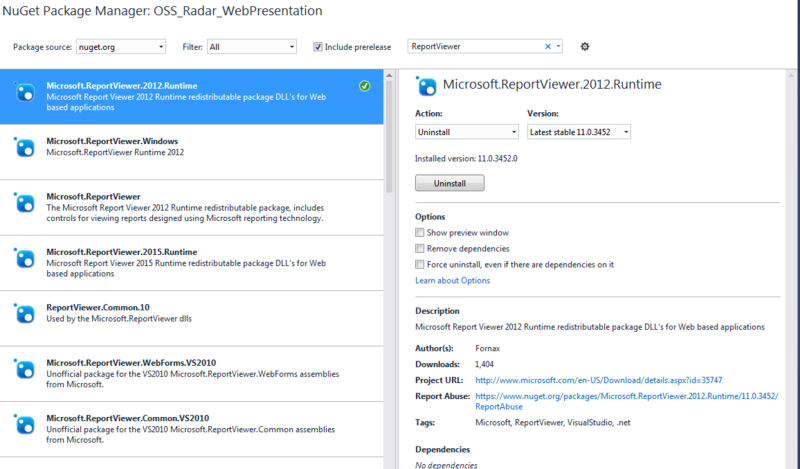 Use below instruction to install updated ReportViewer from Nuget Package Manager console. Just add below assembly reference in your aspx file. Here, 15.0.0.0 is the version number of the ReportViewerControl.WebForms that was installed in my VS. Please check Reference of the Solution to confirm the version number. No need to add PublicTokens (if multiple installation exists, it may creates trouble again). Not the answer you're looking for? Browse other questions tagged asp.net reporting-services reportviewer or ask your own question.